The C&O Canal Trust constructed a new bridge over the canal at Marsden Tract over the weekend of April 21-24, 2016. Skilled volunteers joined C&O Canal Trust and C&O Canal National Historical Park staff to erect the bridge, which arrived in pieces and was assembled in place. On Thursday, April 21 and Friday, April 22, scaffolding was erected to aid construction, while the main assembly of the bridge primarily occurred on Saturday, April 23 and Sunday, April 24. The current bridge, which had fallen into disrepair, remained in place so visitors could still access the towpath while construction took place. 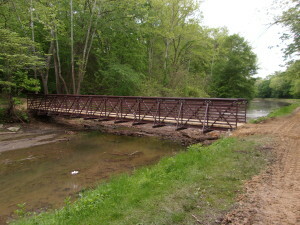 This bridge was funded by donors to the C&O Canal Trust’s Towpath Forever program, with a funding match from the National Park Service Centennial Challenge Program. It is the first project to take place in the Park in honor of the National Park Service’s 100th anniversary. In 2015, the National Park Service received a $10 million congressional appropriation that was matched with $15.9 million from more than 90 partner organizations. The 106 projects, located at more than 100 parks in 31 states and the District of Columbia, are designed to improve visitor services, support outreach to new audiences, and leverage partnerships to reinvigorate national parks while forging connections with communities.